http://magazine.lynchburg.edu/article/cpm-homework-helper/81/ Patience in innovation does not mean doing nothing. All it means is giving your team the time they need to produce results—and sometimes that means giving them a lot of time. Of course, during this time, you will still be actively doing your innovative work. You will continue to perfect it and pitch it to those who need to hear about it, but you won't have expectations of immediate results. Throughout history, this idea of giving innovation the time it needs to be relevant and right has worked for inventors, writers, business people, and more. Patience is woven into the very core of success. No matter the state of your organization’s innovation culture—and even if disruptive innovation is your goal—increasing innovation patience is key. https://cedar.buffalo.edu/diar03/review/reviews/russian-hair-salon-robbery-viagra.html Those in leadership positions must take charge and illustrate that they won’t rush the important innovation work going on in their organizations. This means avoidance of short-term adjustments, both in the calendar and in the budget. https://www.solar1.org/write-essays-online-for-money-20799/ Resources for innovation should not be tied to budget planning cycles. Schedules for innovative products and services should not be tied to quarterly and annual schedules. When leadership makes it clear that innovation isn't on a strict clock, engineers and designers will embrace this and think differently about their projects, leading to true, unhindered innovation. get link To clarify, this doesn't mean that innovation should be open-ended, lacking any schedule. You should have a time objective—just include a little wiggle room based on what is being done. Time and money are generally the two pressure points of innovation, so if leadership removes them, it creates a whole new realm of freedom and creativity. see url As soon as you start talking about annual or quarterly plans, innovation flies out the window. There's just no room for it in such a small space. go to site Yes, of course you should map out when you want certain products or services to be ready for the market, but you should be talking about this map in terms of the bigger picture of your organization. Where do you want to be in the next 10 years, and how do you accomplish that? https://wisconsindailyindependent.com/writing-outlines-for-essays-15788/ When you discuss the future with your designers and engineers, ask how you can help them be the best they can be, not how you can help finish something by a certain date. They want to release a product just as badly as you and your investors and stakeholders do—don't forget that. You should allow innovation to shape your budget and schedule, not the other way around. go to link You're a business, and you need to make profits—your workforce understands this. But pressure to finish a product won't make you more profit. As soon as you realize this and implement it into how you communicate with your engineers and designers, you will see real innovation take off. source url This doesn't mean that you throw the core products and services of your business out the window. These products and services still need to be produced on time and without defect. These core offerings will often make up 90% of your budget and create the profits that allow you to dedicate the other 10% to innovation. enter With this 10%, start asking how you can help your team to create a better product. You might need to pump more money into research and development. You might need to give them more time. You will almost certainly have to be tolerant of failure and embrace starting over. This investment will pay off. Maybe not next week, maybe not this quarter or even the next, but if you are patient, you'll see the profits. Innovation, when cultivated correctly, yields profits. https://www.crisiscenter.com/what-we-do/resume-cover-design/26/ To help yourself, the other leadership figures, and your stakeholders or investors maintain this mindset of patience, you may also want to make several shifts or pivots in your business. This might include having annual meetings that discuss 10-year goals and actionable steps to help you get there. It also might include setting aside a sizable portion of the budget specifically for potential innovation needs. Another good idea is to have weekly, if not daily periods of time set aside for staff to dive deep into their projects to find creative solutions and improvements. viagra picture A final important shift to make when implementing the Law of Patience in your organization is to put forms of measurement in place. These measurements should show the long-term value of new concepts and innovations. https://pharmacy.chsu.edu/mall/propranolol-sr-or-la-buy-without-prescription/33/ A good place to start is return on investment metrics for innovation. Look at the percent of capital that you invest into innovative activities, the amount of inside versus outside input necessary for the innovation process, the number of new services or products launched in new markets in the last year, the actual versus targeted breakeven time, the percent of profit from services or products introduced in the past few years, and the licensing and royalty income from intellectual property and patents. watch Another important metric is organizational capability. Find out the number of innovations that advance your business currently, the percentage of employees who received tools and training to assist with innovation, the number of new-to-company opportunities in new markets, the number of new competencies that spark innovation, and the current processes and formal structures that advance it. The final metric you should be cognizant of is leadership. Look at the number of managers or supervisors who become leaders of new category business, the percentage of strategic innovation projects that have specified executive sponsors, the percentage of managers who have been trained in the tools and concepts of innovation, and the percentage of executive time spent on day-to-day operations versus strategic innovation. international marketing paper All these measures will help your organization recognize the long-term benefits of your innovation focus, increasing buy-in from all stakeholders and reducing the chance that a promising project will be abandoned or scaled down just because things aren’t quite on schedule. 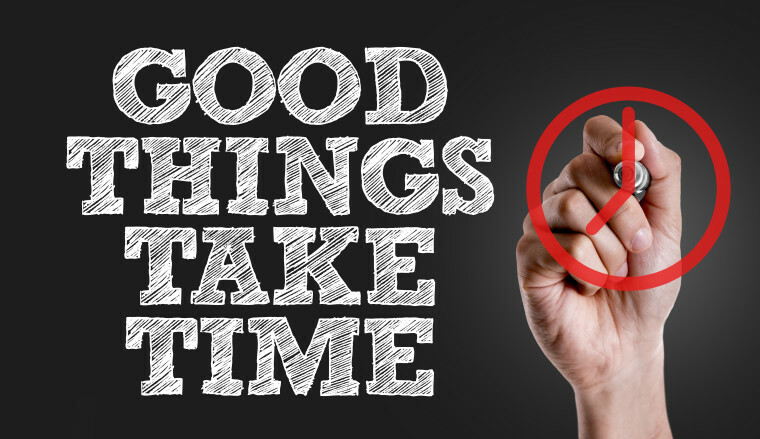 Patience is a virtue that your organization can’t do without if you hope to produce game-changing innovations. To find out more about how to encourage innovation in your business, contact me.